Terms and Conditions: Prices are in Canadian dollars, per person rate based on 2-sharing and subject to final confirmation. Taxes are excluded. 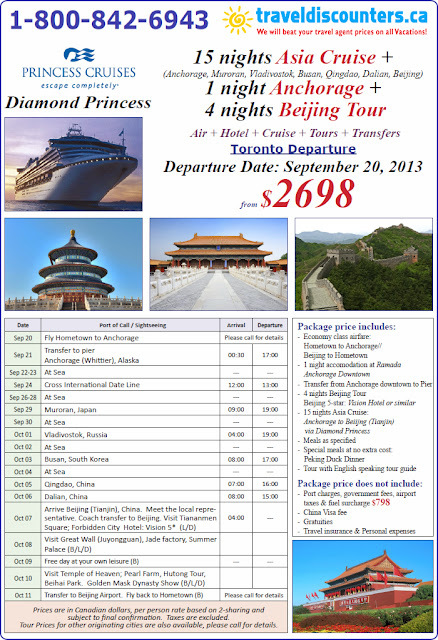 Tour Prices for other originating cities are also available, please call for details. Traveldiscounters.ca: Book Las Vegas and get 2 show tickets!! Book to Las Vegas with us today! Zarkana by Cirque du Soleil at ARIA Resort and Casino. Blue Man Group at Monte Carlo Resort and Casino. Brad Garrett's Comedy Club at MGM Grand Hotel & Casino. KA by Cirque du Soleil at MGM Grand Hotel & Casino. The Beatles LOVE by Cirque du Soleil at The Mirage Resort and Casino. Tournament of Kings at Excalibur Hotel Casino. Zumanity, The Sensual side of Cirque du Soleil at New York - New York Hotel and Casino. Terry Factor at The Mirage Resort and Casino. Jabbawockeez at Luxor Hotel and casino. 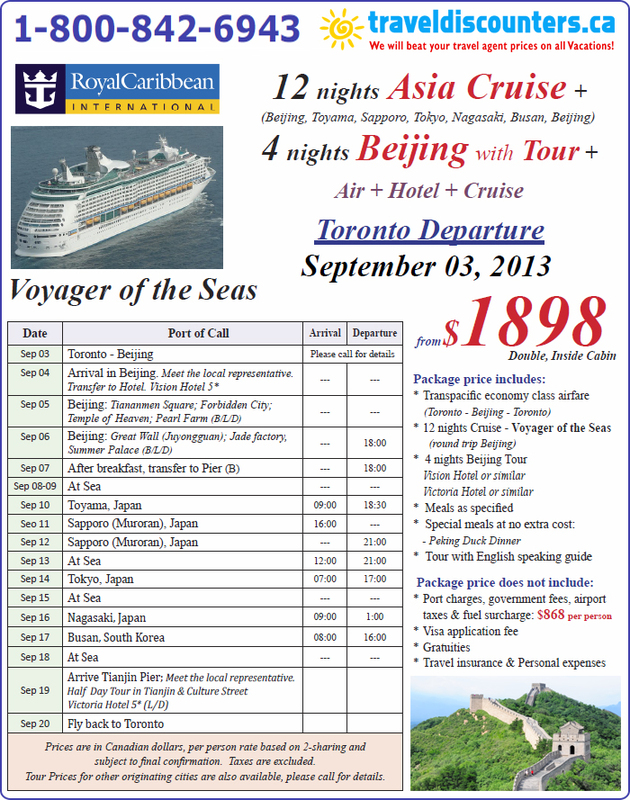 Terms and Conditions: Book by June 20, 2013 (11:59 p.m. MT) for travel until December 30, 2013. Minimum 3-night stay. Participating hotels: ARIA Resort and Casino, Bellagio, VDara Hotel and Spa, Mandalay Bay Hotel and Casino, THEhotel at Mandalay Bay, The Mirage Resort and Casino, MGM Grand Hotel and Casino, Monte Carlo Resort and Casino, New York-New York Resort and Casino. 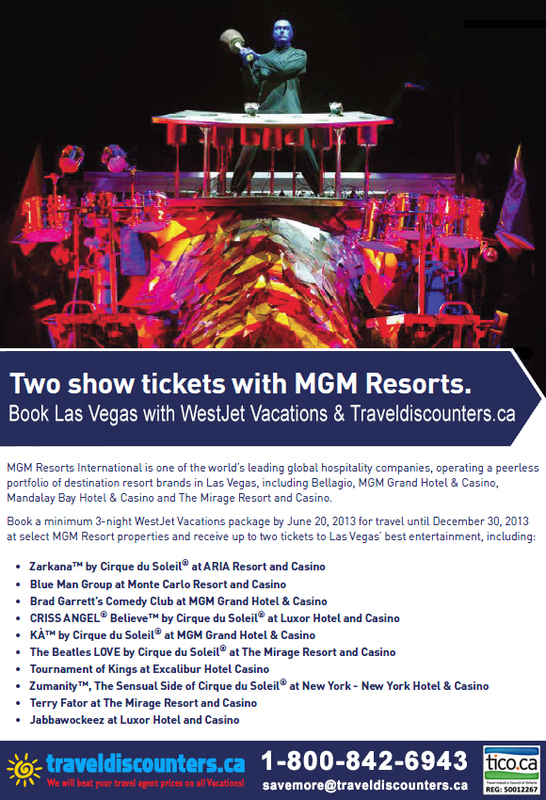 Show tickets must be booked within 72 hours of booking your WestJet Vacations hotel package. One ticket per guest, maximum 2 tickets per room booked. Both tickets must be used for the same show and show time. Single occupancy bookings only receive 1 show ticket. Participants must be at least 21 years of age. Blackout dates: May 25 and June 22 - 24, 2013 inclusive. Reservations that arrive or stay through over the blackout dates will not be applicable for the show ticket promotion. Tickets are not available for all price categories at all performances. Limited seating is available for select performances. Seating availability and location is determined automatically on a first-come firstserveBook by June 20, 2013 (11:59 p.m. MT) for travel until December 30, 2013. Minimum 3-night stay. Participating hotels: ARIA Resort and Casino, Bellagio, VDara Hotel and Spa, Mandalay Bay Hotel and Casino, THE hotel at Mandalay Bay, The Mirage Resort and Casino, MGM Grand Hotel and Casino, Monte Carlo Resort and Casino, New York-New York Resort and Casino. 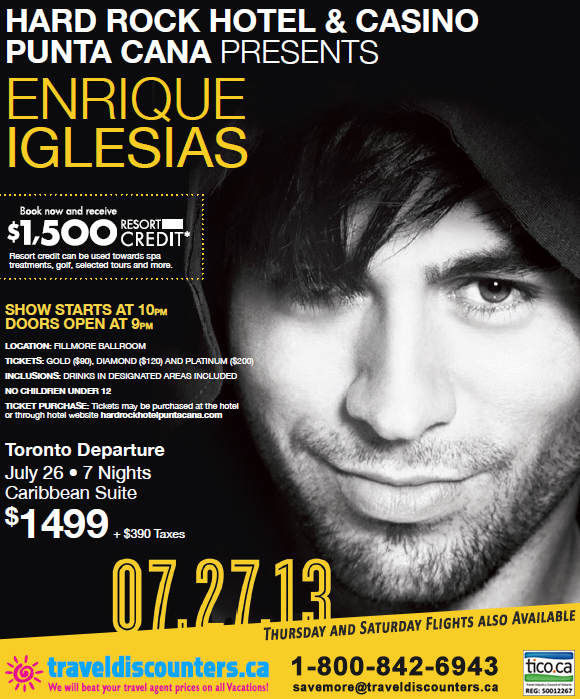 Show tickets must be booked within 72 hours of booking your WestJet Vacations hotel package. One ticket per guest, maximum 2 tickets per room booked. Both tickets must be used for the same show and show time. Single occupancy bookings only receive 1 show ticket. Participants must be at least 21 years of age. Blackout dates: May 25 and June 22 - 24, 2013 inclusive. Reservations that arrive or stay through over the blackout dates will not be applicable for the show ticket promotion. Tickets are not available for all price categories at all performances. Limited seating is available for select performances. Seating availability and location is determined automatically on a first-come first serve basis. This offer cannot be combined with any other offer. Tickets have no cash value and do not accumulate if unused. Consecutive reservations will be excluded from receiving show tickets. Show tickets can only be redeemed by the primary guest as it appears on the reservations. Guest must check into the hotel prior to picking up their show tickets. A daily resort fee which includes select resort amenities may be added to your room account. MGM Resorts reserves the right to cancel, suspend or modify this offer at its sole discretion and without prior notice. Advance booking required. Non-refundable and non-transferable. Offer limited and subject to availability. Offer subject to change and expiry without notice. New bookings only. Not valid on group bookings. basis. This offer cannot be combined with any other offer. Tickets have no cash value and do not accumulate if unused. Consecutive reservations will be excluded from receiving show tickets. Show tickets can only be redeemed by the primary guest as it appears on the reservations. Guest must check into the hotel prior to picking up their show tickets. A daily resort fee which includes select resort amenities may be added to your room account. MGM Resorts reserves the right to cancel, suspend or modify this offer at its sole discretion and without prior notice. Advance booking required. Non-refundable and non-transferable. Offer limited and subject to availability. Offer subject to change and expiry without notice. New bookings only. Not valid on group bookings. Even the most independent traveller appreciates a helping hand once in a while. City Package & Excursions include a number of interesting outings or extras to get you started on your travels. Terms and Conditions: Transfers between Airport, hotels and train stations are not included. Flights are from Toronto via Air Transat. Prices shown are per person, based on double occupancy in lead room category, option 1, unless otherwise stated. Space and prices are subject to availability at time of booking and subject to change without prior notice. Taxes and fees are extra and noted above. Terms and Conditions: Flights are from Toronto via Air Transat or CanJet. Prices are per person based on double occupancy in lead room category for new individual bookings. Space and prices are subject to availability at time of booking and subject to change without prior notice. Taxes and fees are extra and noted above. Some flights are 100% non-refundable at time of reservation. Certain restrictions apply. Ship registry: Bahamas, Panama, Malta. Book now and receive $1,500 in Resort credit. Terms and Conditions: Price is gross per person based on double occupancy for 7 nights on all inclusive vacations (unless otherwise specified) and was available at the time of printing. Seats at the above price are limited and subject to change without prior notice. Applicable to new bookings only. Transportation taxes & related fees shown must be pre-paid. 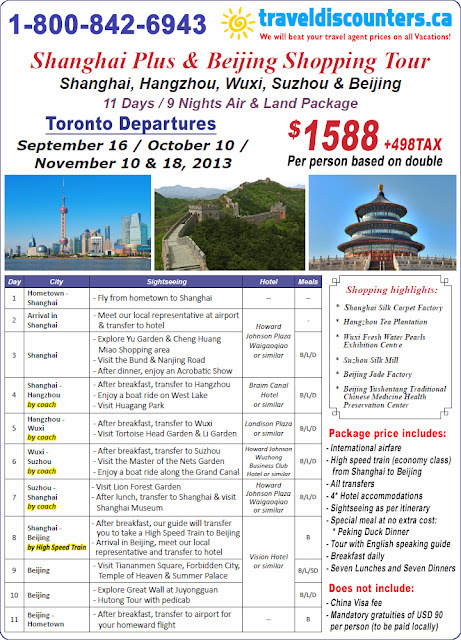 Applicable local taxes payable in destination are extra (DR $30US). *Resort credit is in US funds, per room, has no cash value, is non-transferable and cannot be carried over to future stays. All services and products are subject to availability. We specialize in last minute holidays, cheap vacation packages, flights, cruise and tours, or any other travel arrangement you will need for your next vacation. Our company is used by almost all tour operators as an outlet to sell their unsold inventory at huge discount prices. We work on the principle of low margins and high volume. We sell our products throughout Canada from coast to coast and the USA.